Alcohol is obviously one of the highest markups at restaurants, so I tend to favor happy hours or special offers, etc. 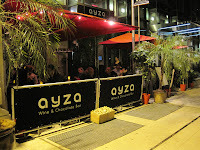 This past Friday, however, my friend and coworker Patty & I splurged on a trip to Ayza, a wine and choclate bar in midtown Manhattan. 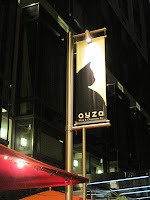 We popped in to see our friend Mel & her boyfriend, who were celebrating a milestone (anniversary, yo!). Patty hadn't met the Beau yet, so we said our hellos and then grabbed a table nearby to sample what we HEARD were really good chocolate martinis. These aren't just good--they are GREAT. 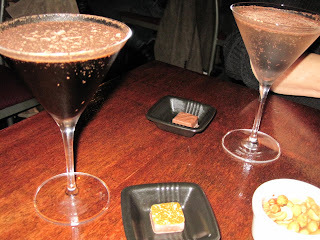 Before Ayza, I'd had enough chocolate martinis in my life (exactly 2) to realize I did not LIKE them. They tasted like jet fuel and not at all like chocolate, and I didn't see the point in further punishing my esophagus. 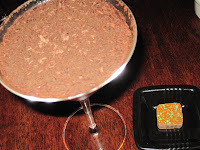 Ayza, however, makes a chocolate martini to end all chocolate martinis. While they are strong, they don't BURN. 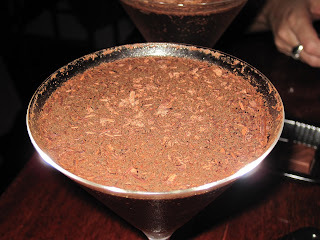 They were smooth and just a little sweet, and the chocolate shavings on the top of the drink make for a sweet ending. And for a touch of extra sweetness, they include a choclate with each drink. I had a salted caramel truffle--nice! Hmmm... you must have had a poor bartender on those first two martinis. The kind my local bar makes is like a white Russian, except you use creme de cacao (that Godiva stuff) instead of kahlua. I have also had them the other way... but the white Russian style is much better!